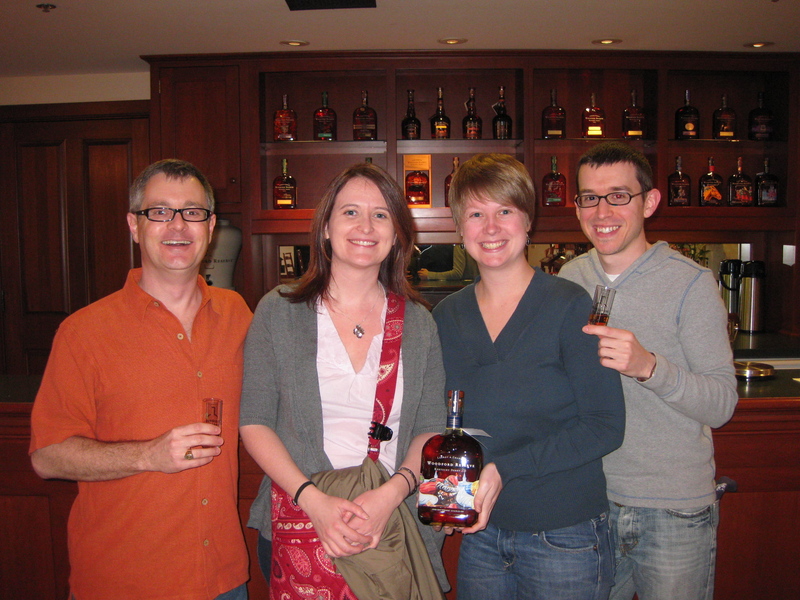 Art, Tara, Katie & Brandon at the Woodford Reserve Distillery. Katie is holding last year's commemorative Kentucky Derby bottle. Yesterday, we began our Bourbon Trail adventure with stops at Woodford Reserve, Four Roses and Wild Turkey. As expected, our tours at Woodford and Four Roses overlapped a little (“Did you know that all bourbon must be made from a grain mixture that is at least 51% corn?”), but each was also surprisingly fresh and interesting. I’d show you pictures of the fermenting yeast concoction we saw at Four Roses, but they turned out a sickly green. Perhaps our favorite experience was being in the barrel warehouse at Woodford Reserve — an olfactory overload so blissful that we were all reluctant to leave. Tara actually bought a bourbon-scented candle a little later, and at Wild Turkey (which we didn’t tour), we picked up bottle of Russell’s Reserve, supposedly not available back in our home state. We all took sips back in the hotel room, and it’s an interesting bourbon — smooth but with a slightly bitter finish. This morning, we head out for Buffalo Trace — home of Blanton’s, in the opinion of at least three of us the finest bourbon on the market today. We’re doing two tours there, the regular tour and then a special hard-hat tour. We are tingling with anticipation. If I should appear to be suggesting that such a man proceed as quickly as possible to anesthetize his cerebral cortex by ingesting ethyl alcohol, the point is being missed. Or part of the point. The joy of bourbon drinking is not the pharmacological effect of the C2H5OH on the cortex but rather the instant of the whiskey being knocked back and the little explosion of Kentucky U.S.A. sunshine in the cavity of the nasopharynx and the hot bosky bite of Tennessee summertime—aesthetic considerations to which the effect of the alcohol is, if not dispensable, at least secondary. The pleasure of knocking back bourbon lies in the plane of the aesthetic but at an opposite pole from connoisseurship. My preference for the former is or is not deplorable depending on one’s value system—that is to say, how one balances out the Epicurean virtues of evocation of time and memory and the recovery of self and the past from the fogged-in disoriented Western world. In Kierkegaardian terms, the use of Bourbon to such an end is a kind of aestheticized religious mode of existence, where as connoisseurship, the discriminating but single-minded simulation of sensory end organs, is the aesthetic of damnation…. This essay appeared in Percy’s collection Signposts in a Strange Land and has been excerpted and reprinted widely. Find more of the essay here.